Sen. John McCain took to the airways on his gazillionth appearance on the Sunday shows this weekend and when asked for specifics on what U.S. policy should be to defeat ISIS, demanded that President Obama should come up with one. Someone please explain to me why anyone thinks this bitter old warmonger and his opinions are worth listening to? He has absolutely no solutions for anything when it comes to our foreign policy other than to attack President Obama at every turn, and to demand we pour more arms into every volatile are of the world and hope for the best. GARRETT: Senator John McCain joins us now from Cottonwood in his home state of Arizona. Senator, specifically as you can, can you describe for our audience what a full-blown strategy against ISIS would look like? MCCAIN: A full-blown strategy would be recognizing that we now are facing the largest, most powerful, wealthiest terrorist organization in history, and it is going to require some very strong measures to defeat them. And they must be defeated, not contained. And we -- first of all, we have to have a strategy. The president said he didn't. But what are our goals there? If you want to build coalitions, what are you telling our allies, that we want to save people who are stranded on mountaintops or protect American troops? You have to have a specific strategy to defeat ISIS. And that means, among other things, understanding that ISIS has obliterated the boundaries between Syria and Iraq, main headquarters being in Syria. So we have to get better weapons to the Peshmerga. We have to have airstrikes in Syria as well as Iraq. We have to arm the FSA, the Free Syrian Army. One of the biggest mistakes ever made in my view in recent times was the president's overruling his entire national security team, including the secretary of state, that argued two years ago for providing weapons for the Free Syrian Army. That was a seminal moment. Remember, this is a president who said it is not a matter of whether, but a matter of when Bashar al-Assad would go. We have to have reconciliation between the Sunni and the new government in Iraq. And most of all, we have to have a clear strategy dictated by a policy, and that policy has to be, we have to defeat ISIS, not contain, not stop, but defeat ISIS, because they are a direct threat over time to the United States of America. GARRETT: Let me pick up on that, Senator McCain. Are you saying we are at war and should say so clearly to the world and to Congress with ISIS, and does that also mean introducing special forces into the mix? MCCAIN: I think that it requires additional U.S. troops, not ground combat units, but it is going to require some more special forces. It is going to require some more forward air controllers. It is going to require some more advisers for training of the Iraqi military, which right now is, as we all know, near collapse. And we have to also work closely with the Kurds and help a very -- especially with weapons to the Peshmerga, which is a very -- they can fight, and Iraqis will fight. But there has to be a policy and a strategy to implement that policy. And first we have to tell -- if we want to build a coalition, we have to tell those people what our goals are. And these people, by the way, are very cynical, particularly the Saudis and others, because we said we were going to strike Syria, and then the president reversed himself without even telling them. GARRETT: Is this a war footing we should be on with ISIS? Does it represent that much of a danger, and should that be the organizing principle of the strategy whenever it is developed? MCCAIN: I think it starts with an understanding that this is a direct threat to the United States of America, that it may be one of the biggest we have ever faced. I was astounded when the president of the United States said that the world has always been messy and it has been accentuated by social media. That means that the president of the United States is either in denial or overwhelmed. He is either in denial or overwhelmed, one of the two, because whether it be Ukraine, which maybe we will have time for a few minutes on, but that this is a direct threat to the United States of America. The Fox News host portrayed Bill Barr as not doing his job, but rather Trump's service. 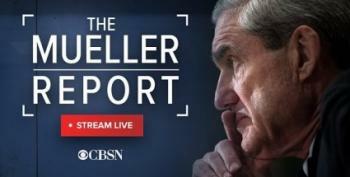 As promised, Attorney General Bill Barr is holding a press conference to spin the Mueller report. Your live stream is here. The Morning Joe host called for Congress to create more laws to stop would-be tyrants. Frank Figliuzzi doesn't sugarcoat it. The Russians are guilty of meddling, and we need to see the report. Bill Barr has changed Joe Scarborough's mind about the integrity of our institutions.